Okay, you probably knew this already, but I've got to represent! 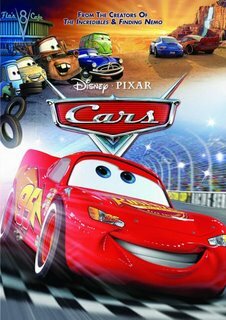 The Cars DVD features the short "One Man Band" as well as a new short, "Mater and the Ghostlight", which I had the pleasure of working. And, of course, you'll find the teaser for Ratatouille, the next great film from director Brad Bird. This is a single-disc edition, and as far as I know there are no plans for a two-disc set (bummer, yes). I'll be posting a highlight reel of my work on Cars soon, but in the meantime, I hope you enjoy the movie! P.S. A few people (Hans, Noah) have noted that there is a two-disc set available exclusively through WalMart, the second disc being called "Geared Up: Bonus DVD Disc". From what I can tell this second disc is just music video stuff, and likely doesn't contain any original Pixar content. Personally I avoid shopping at WalMart anyway, but if you're a Rascal Flatts fan then maybe you'll enjoy the extra disc. I saw a commercial on this for a promo deal at WalMart-it's not an 'official' 2-dvd set, but hey it's worth checking out! Looking forward to seeing your contributions Victor! I imagine a certain job title change for Mr. Lasseter was a major factor to this DVD only being a single disc offering. Can't wait for Ratatouille - it's the most "organic" looking 3-D movie I've seen. From what I can tell from the teaser a lot of those poses look 'Drawn'. I take it you're flexing your animator muscles on that one too??!! Target all the way on this dvd!!! I totally recommend it! Ok, that's all...hope this helps! There is however another two-disc set at Target, that seems to have some more interesting "behind" material on it. I share your thoughts on Walmart though and should be imprinted with the big "Hypocrite" stamp whenever I enter the big blue machine. Looking forward to seeing your "Cars" reel. Hey all those "extras" were on the cars video podcast. They are great! Can't wait to see the reel! Really, can't wait... I'll be right here. Refreshing and reloading. Hey Victor, do you have any idea if there will be a special edition of Cars anytime in the future? The special features on the Monsters and Incredibles DVD are just priceless, it would be great to have similar material for Cars at some point. Is it Animation or Performance Capture?